Feeling the winter blues? 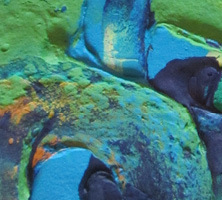 Colorful abstracts hanging in your office create a positive change in your environment. You spend 8 hours a day in your workspace, so make your space professional yet inspiring with modern abstract art. 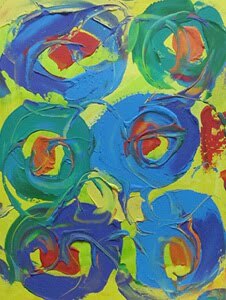 Abstract art helps people relax yet feel energized. Hanging modern abstracts on your office walls puts you in a whole new mindset. Your coworkers will be influenced by your productivity and gossip less. Your boss is either impressed with your work, or they’re afraid you will replace them! To start your office makeover measure your walls and decide if you can hang 1 or 2 colorful abstract canvases. Only choose modern abstracts that connect with you. Next if you need more space, declutter and you’re done! 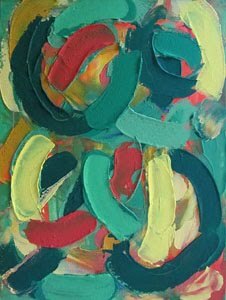 The great thing about contemporary abstract art is that colorful abstracts outshine old decor, so you can still use your old furniture. 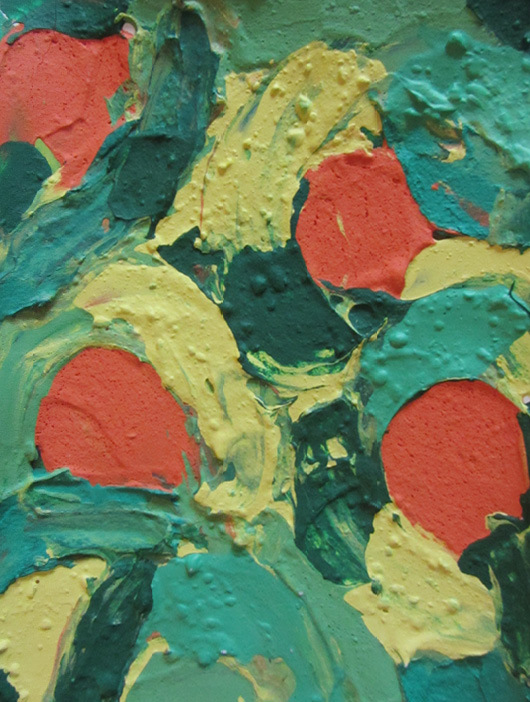 The abstract painting Moonscape is a textured painting in green, deep green, yellow and orange. In this modern art the paint is applied thickly on canvas. Do you ever dream you’re walking on the moon? It’s a surreal experience that reveals your subconscious mind wants you to go somewhere you’ve never been. This original wall hanging measures 18" x 24". As an abstract artist I’m always growing and improving my painting techniques. 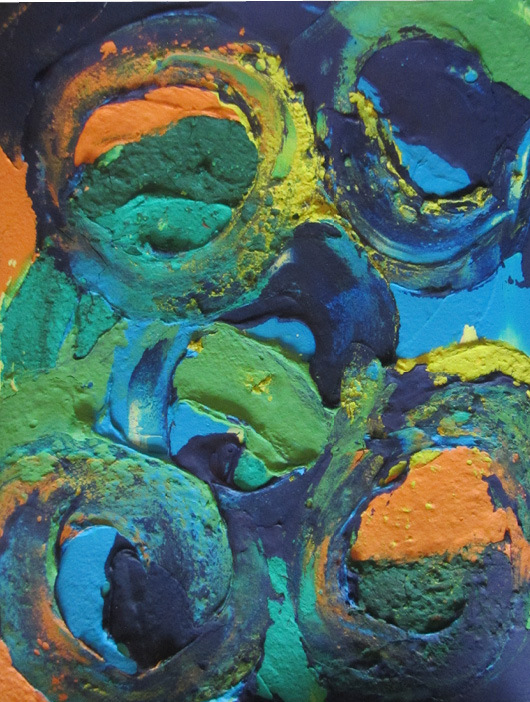 I expand my style by adding more bold color and thick texture to my canvases. 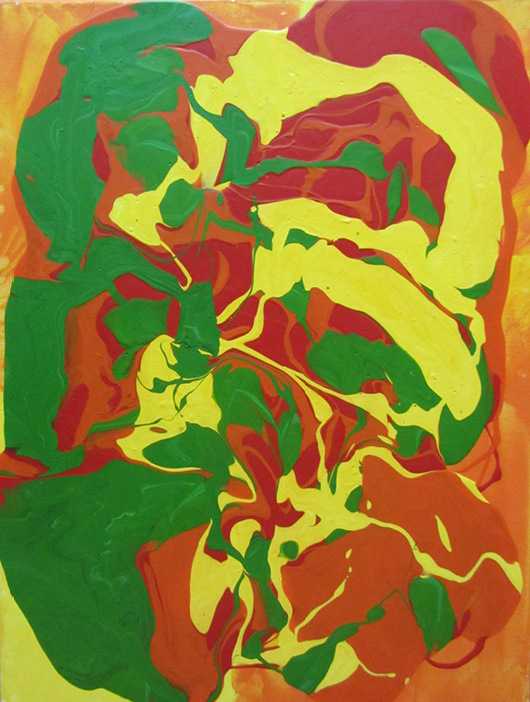 I’m also growing to appreciate some of the bold abstracts I’ve painted, but put aside. I didn’t see their uniqueness at the time, but as I mature and experiment, my artistic tastes expand to include more abstract art styles and now when I go back through my stack of rejected and forgotten abstract paintings I have the ability to make improvements to those modern wall hangings that needed extra contemplation. Never reject any modern art you’ve painted. Instead try to expand your style with that canvas as a starting point. 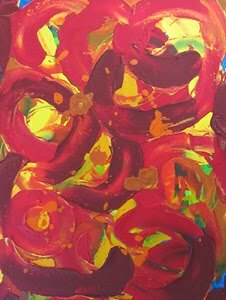 Having several painting sessions with difficult abstracts will help you foster a connection to your art. 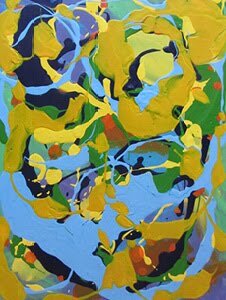 You’ll achieve a depth of expression in your contemporary abstracts through color, texture, movement of the brush and layering. You just need to allow yourself the time to get there. You may also notice that putting some time between your painting sessions helps you go back and critic your artwork in a constructive way that moves you forward. So when an abstract canvas is not working, it’s best not to push. Some painted canvases I may not look at for several months, I work on other modern abstracts instead, so I have several modern paintings on the go that I will come back to until they are finished. 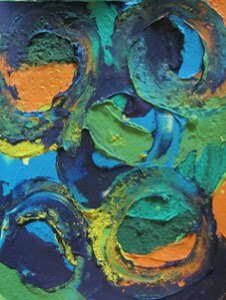 The abstract painting Sun, Moon and Stars shown above is a textured acrylic in green, deep blue, yellow and orange. In this modern art the paint was applied thickly on canvas. Looking up at the sky and imagining what might be out there that is yet undiscovered is bewitching and awe inspiring. The magical unknown. This original wall hanging measures 18" x 24". 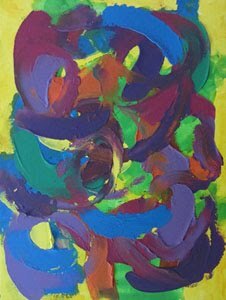 I paint colorful abstracts. 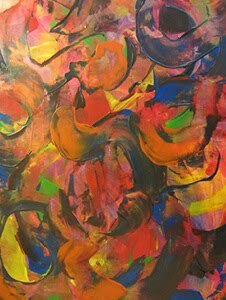 Before I paint I consider what will make each abstract I paint work in a room to rejuvenate the space and make it inspiring. 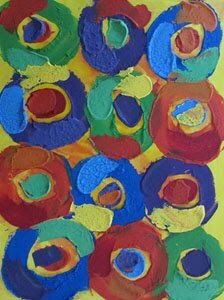 Using color is a good way to achieve this, especially when color is combined with texture on canvas. Usually something good comes out of it my time in the studio... but other times there are challenges. 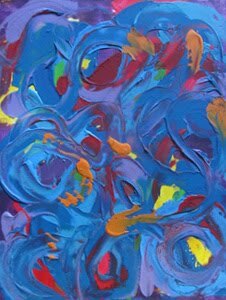 I can paint several abstract paintings during the week. I want my modern abstract paintings to be unique and fresh so I always try something new. But even if my abstract painting experiments don’t work out, I learn something for next time and I can’t wait to get back to the studio. Abstract paintings can look simplistic, but actually getting the right balance of color, texture and movement across the canvas is not easy. At times I may feel like I’m not up to the challenge. That can all change in a moment when I take a deep breathe and let go of expectation and just put my brush to the canvas. After all small changes made to a less than original painting (also known as a disaster) can be interesting and one step away from brilliant. 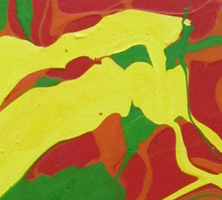 The abstract painting Garden Grasshopper is a textured acrylic in green, yellow, red and orange. 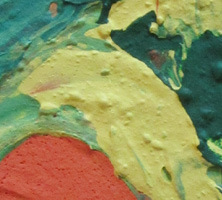 This modern painting was poured and blended on canvas. Admiring nature in the garden is calming and watching even the smallest of creatures like the grasshopper who has existed before the dinosaurs is fascinating. This original wall hanging measures 18” x 24”.